Beginning your performance journey is so exciting. Finally after months of practice, training and perfecting your act, it's time to take to the stage and claim the spotlight. When diving into your first showcase, it's easy to get carried away with all the glamour, excitement and yes, even stress! To make sure you leave a lasting impression both on stage and off, it's important to consider how your attitude and behaviour contributes to the night. When everyone works together to create a positive environment, the show runs so much better! Whether it's your first Nightcap student showcase, or you are taking to the stage as a solo performer, our handy Etiquette Guide has everything you need to know. Applying to perform at an upcoming show is so exciting, and preparing your application perfectly the first time will save you (and the event organiser) a whole lot of stress! Make sure you read the show description and application closely to see what the requirements are for the event. Some events may have certain production specifications or venue limitations, or may have guidelines around specific content. Read all the information before you apply! Having a promotional package ready to go is a great idea when you are planning on applying for shows. Your package should include professional performer photos, videos and descriptions of the acts you wish to apply with, a short bio (usually about 300 words) about yourself as a performer, and production specifications you will require for your act. Once you have been accepted, make sure to respond to all communication from the producer promptly and within the deadlines. Producers should not have to hound you for your music and stage tech information! Have a folder saved for each act you have with your music file and a PDF with your tech specifications so you can easily send it through to the producer. It's the day of the show and everything is super exciting! The most important thing you can do on the day of your show is be on time. Familiarise yourself with the location of the venue well in advance, and plan your trip accordingly. Make sure to check the public transport services, or see if there is adequate parking nearby! This will save you lots of stress on the day. If your show has a rehearsal, make sure you utilise it to its full potential. Be ready to start on time, and have everything ready that you need to rehearse with. Rehearsals and tech runs usually run to a tight schedule, so listen to instructions and plan your run-through accordingly. Any stage set up or post performance pack-up. This is a great time to meet the stage assistants and show them what you need. Your lighting and music cues. Confirm with the sound technician to make sure everything runs smoothly. 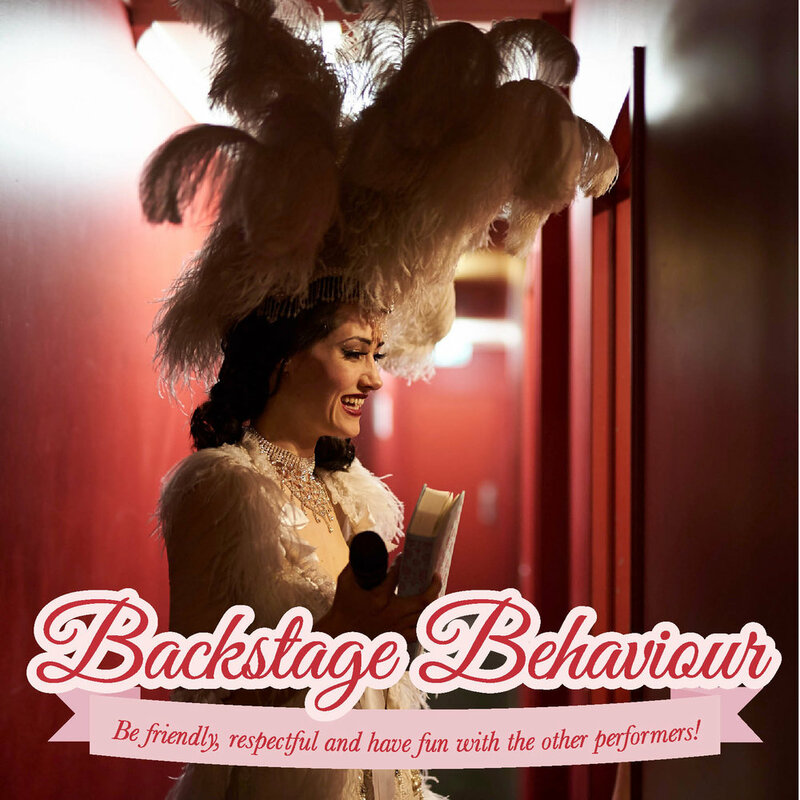 Backstage is the haven for performers and your place to prepare before you hit the stage! Make sure to always act with politeness and respect when you are backstage. There are usually many performers in showcases and events, so the backstage area can be quite crowded! Be kind to other performers, and have patience, everybody is equally excited and nervous! When waiting backstage, it's important to keep the volume to a minimum, as sometimes the audience out the front can hear you! You wouldn't want to have background noise coming through when you are onstage performing, so make sure to extend the same courtesy to your fellow performers. Know the running list and make sure you are ready to go onstage at least two acts before your own. Listen to your Stage Manager, as they will give you any important information about the show, and tell you where to go! It's the Stage Manager's job to make sure everything runs smoothly backstage. They will be responsible for managing performers, stage cues and the stage assistants. If the Stage Manager gives you a direction, listen and do as they ask; they are the boss! It's time to hit the stage! You've got the perfect act rehearsed and ready to go, and now it's your time to shine. But when developing your act for an event, there are a few things you should consider in your planning process. Cultural appropriation is a hot topic at the moment and for good reason. Cultural appropriation is the adoption of certain elements from another culture without the consent of people who belong to that culture. Many individuals of other cultures and minority groups find this very uncomfortable and offensive, especially if it is performed by someone who is not a part of their specific cultural group. As a general rule, you should not represent a culture or minority group in your performance unless it is your own culture, or you have the permission and guidance of the group you are representing. You can read more about cultural appropriation here and here. It's also important to consider the accessibility of your act. Does it contain potentially triggering subjects that may make the audience uncomfortable? Do you use strobe lights or very loud noises? It's a great idea to flag this with your producer as soon as possible to avoid any dramas on the night.. When your performance is done and dusted, it's time to sit back and relax! Some events may allow you to come into the audience to see the rest of the show. If this is the case, change out of your performance costume, and make sure to enter the audience discreetly. It's a good idea to enter the space in between acts so you don't distract from another performer! If you do need to leave before the show is over, make sure you do so quietly and professionally. If you can, say a quick thanks to the Stage Manager and/or organiser for having you. Check that you have all of your props and belongings, and try and leave discreetly, so that you don't disturb the performances. Many shows and events will have a professional photographer taking pictures of the performers. Sometimes there is even a videographer who will take a video of your performance too. Often these will be provided to you after the event by the photographer or the producer, for you to save and share. Most photographers and events are happy for you to post their photos on your social media accounts, but usually require you to credit them in your descriptions. This may include tagging their social media accounts and/or linking to their website. Not only is this something that photographers usually ask for, but its the polite thing to do - as performers, we are small businesses and creatives, and we want to support other small businesses too! You can read more about photograph ownership here.